Sol Price began his career as a lawyer and moved on to become a tough-minded businessman who pioneered the concept of warehouse superstores and later became a major philanthropist. He was best known as the founder of Price Club, which he built into a chain of almost 100 stores before merging it into Costco. But long before that, he introduced his high-volume, low-price approach with Fed-Mart which first opened in 1954. At its peak Price Club was San Diego County’s largest public corporation. Before becoming a retailing entrepreneur, Mr. Price practiced law in San Diego for a number of years in the firm that is known today as Peterson & Price. 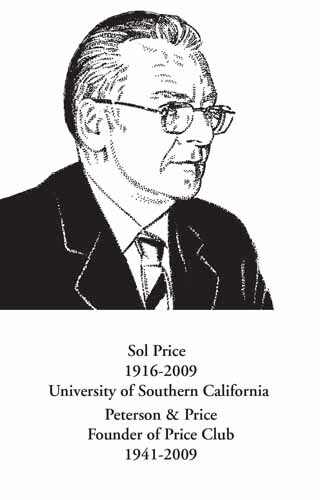 The son of Jewish immigrants who came to the United States from Russia, Mr. Price went on to graduate from San Diego High School before earning his undergraduate and law degrees from the University of Southern California. He was also active in Democratic politics. He was an early backer of the late Gov. Edmund G. “Pat” Brown, as well as Brown’s son Jerry, the former and current state attorney general. His involvement in the Democratic Party was so great that presidential candidates visited him, including then-Sen. Barack Obama in 2006. Perhaps Mr. Price’s most lasting legacy to the residents of San Diego lies in his philanthropy. He used his wealth to benefit causes he believed in. His philanthropic work, ranging from a major economic development initiative in City Heights to helping start the Center for Public Interest Law at the University of San Diego, left behind a legacy of education and community improvement. The Price philanthropy did not stop there. In 1995 with his wife, Helen, Mr. Price established The Price Family Charitable Fund to provide grants and to support many causes and groups. And, after the death of his 15-year-old grandson, Aaron Price, Mr. Price started the Aaron Price Fellows Program to provide high school students with an introduction to a variety of city, county and community institutions as well as trips to Sacramento and Washington D.C.
Mr. Price was predeceased by his wife Helen and grandson Aaron. He is survived by sons Robert and Larry; and five grandchildren.